Ladies and gentlemen. Brothers and sisters. I come here before you to express my opposition to the Islamic State. I do not back the Islamic State. I do not stand for the Islamic State. I do not defend the Islamic State. And I would not kill and die for the Islamic State. I am sure you are all pleasantly relieved that I come in peace. Now that you are at ease, please allow me to clarify the difference between an Islamic State and an Islamic Ummah. The Islamic State is a misnomer. The Prophet Muhammad, peace and blessings be upon him, never, ever, described his system as a dawlah, a khilafah, a sultanah, a jumhuriyyah or a dimukratiyyah; he never described his system as a State, a Caliphate, a Sultanate, a Republic or a Democracy. On the contrary, he described it as an Ummah, a Motherland, a Homeland, a Federation or a Confederation. In other words, the Prophet Muhammad, peace and blessings be upon him, wanted to create a Union of Free People under the precepts that he conveyed in the Covenants that he made with Jews, Christians, and Zoroastrians; namely, under the precepts of the Qur’an: freedom of movement, freedom of work, freedom of study, freedom of religion, and freedom of choice. These are the very freedoms that the Prophet granted in his Covenants. Self-professed Islamists and self-professed Jihadists have been supposedly fighting to create a so-called Islamic State for over a century. Some claim that “the Qur’an is our Constitution” which essentially means that they have no concrete plan. Not only are they devoid of any concrete plan, they act and operate in ways that contradict the Qur’an. More than mere ignorance, such behavior is indicative of hypocrisy and dishonesty. Imagine the paradox: a person fighting for Socialism who is not familiar with the Communist Manifesto; a person fighting for human rights who is not familiar with the Universal Declaration of Human Rights; a person who is fighting for democracy who is not familiar with the American Constitution. And yet we have people fighting for an “Islamic State” who ignore the fact that the Prophet created an Ummah, and not a State; and that he produced a constitution for that Ummah. Al-Dustur al-Madinah. Al-Sahifah al-Madinah. The Ummah Document. The Constitution of Madinah. The Covenant of Madinah. If I mention the Qur’an, every Muslim has heard of the Qur’an. In fact, most non-Muslims have heard of the Qur’an. However, if I mention the Covenant of Madinah, most Muslims have never heard of it; and virtually no non-Muslims have ever heard of it. And yet this document comes second only to the Qur’an. 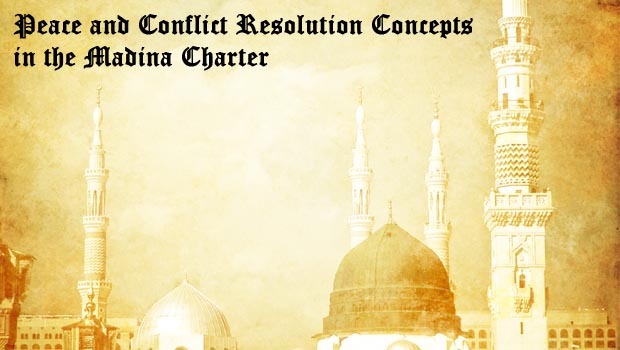 Fortunately, as a result of the publication of The Covenants of the Prophet Muhammad with the Christians of the World in 2013, the proclamation of the Marrakesh Declaration in 2016, and its endorsement by the Organization for Islamic Cooperation, Muslims are becoming increasingly aware of the Covenant, Constitution or Charter of Madinah. So, what’s the story behind the Covenant of Madinah? Let me take you back 1400 years. The Prophet Muhammad, peace and blessings be upon him, receives revelation. He is persecuted for a decade. He flees with his followers from Makkah to Madinah. At that time, there were approximately twenty or thirty thousand people living in and around Madinah: half of them were Jewish and half of them were polytheists. The Muslims, however, only numbered in the hundreds. However, they all accepted the Prophet as their leader. Did the Prophet kill all the non-Muslims? No, not at all. On the contrary, he said: “Fraternize in the name of God: you are all brothers.” He brought together Arabs, Jews, Christians, and pagans. In fact, the first thing that he did after arriving in Madinah was to protect the rights of all the citizens of his newly-formed Ummah. He prepared a Constitution for his Commonwealth in consultation with all of his constituents; the first political charter in history. This is a document from Muhammad, the Prophet [governing the relations] between the believers and Muslims… and those who followed them and joined them and labored with them. They are one community [ummatun wahidah] to the exclusion of others. The Jews must bear their expenses and the Muslims their expenses. Each must help the other against anyone who attacks the people of this document. They must seek mutual advice and consultation, and loyalty is a protection against treachery. From day one, the Prophet’s system was an Ummah: it was pluralistic, multiethnic, multiracial, multilingual, and multireligious. Islam was preeminent, extending wings of mercy upon all those it embraced, be they Jews, Christians, polytheists, Zoroastrians, agnostics, or even atheists. They were all included in one Ummah. It is not permitted to remove a bishop from his bishopric or a Christian from his Christianity, a monk from his monastic life or a pilgrim from his pilgrimage or a hermit monk from his tower. Nor is it permitted to destroy any part of their churches, to take parts of their buildings to construct mosques or the homes of Muslims. I, Muhammad b. ‘Abdullah b. ‘Abd al-Muttalib, have commanded that a covenant of protection and security be written for the Samaritan community for their persons, their children, their property, their wealth, their places of worship, their financial endowments, and to be binding in all the provinces and places in which they reside. We also pledge to behave with them and the people of Palestine in the best possible manner. I have removed from you that a forelock of yours shall be cut off, to wear clothing that differentiates you from the rest of the people, and the jizyah, and this until [the day] of the gathering and dispersal. Their hands are free to do as they please concerning their fire temples and its wealth. No one should prevent them from… carrying out their funeral processions, and to abide by what they normally abide by concerning their religion and sect. The Zoroastrians priests should be granted exclusive privileges from among the various sects of those people who are protected [by the Muslims]. As can be appreciated from these prophetic traditions, the Messenger of Allah did not simply ask Muslims to tolerate the People of the Book: he commanded his followers to engage with them, dialogue with them, and love them as fellow human beings. He called upon Muslims to protect them and defend them. It is what we call pluralism, the energetic engagement with diversity; the practical and concrete application of human rights. So, yes, I support the Ummah; I back the Ummah; I stand with the Ummah; I defend the Ummah; and I would kill and die for the Ummah: the true Islamic State; not that un-Islamic State; not that pseudo-Islamic State; and not that anti-Islamic State. I believe in the Ummah of Muhammad, the Confederation of Believers that is based on the Covenant of Madinah and the Covenants of the Prophet; an Ummah based on justice, tolerance, and diversity. Amen.